Living up to the Secretary-General’s guiding principle of “Leaving No-One Behind” necessitates the understanding that demography matters for sustainable development and that population dynamics will shape the key developmental challenges that the world in confronting in the 21st century. 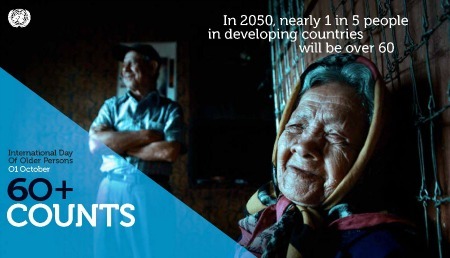 Not addressing older persons means not addressing 20 per cent of the global population by 2030, where there will be more people over 60 than children under 10, with the most rapid change in age structures occurring in the developing world. If our ambition is to “Build the Future We Want”, we must address the population over 60 which is expected to reach 1.4 billion by 2030. UNDESA-DSPD and the NGO Committee on Ageing are celebrating the 2014 International Day of Older Persons. The commemoration will be held on Thursday, 9 October 2014 from 10:00 a.m. to 1:00 p.m. at the United Nations Headquarters.